In 1835 Alexander Vallincourt hires on as a cabin boy on a schooner. The ship and crew embark on a voyage in the Arctic Circle late in the fall season. The ship becomes entrapped in an ice flow, forcing the crew to abandon ship. Vallincourt becomes lost, and nearly succumbs to the elements. Rescued by an Inuit tribe Alexander is given water from a mystical pool. He is told that because of the water he will live forever. He meets a young woman named Liak. 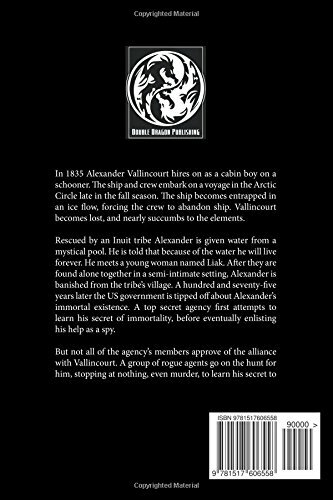 After they are found alone together in a semi-intimate setting, Alexander is banished from the tribe’s village. A hundred and seventy-five years later the US government is tipped off about Alexander’s immortal existence. A top secret agency first attempts to learn his secret of immortality, before eventually enlisting his help as a spy. But not all of the agency’s members approve of the alliance with Vallincourt. A group of rogue agents go on the hunt for him, stopping at nothing, even murder, to learn his secret to immortality for themselves. Find Joel Goulet novels in the genres of: Horror, Fantasy, Historical Romance, Thriller, Mystery, Western, and Science Fiction. Read Joel Goulet’s novels for FREE on Amazon Kindle Unlimited, or buy them at prices starting at 3.99 at Amazon, Barnes and Noble, and other online book sellers such as Apple, Kobo, Scribd, Inktera , Baker & Taylor. ( prices vary by company) Do author name search –Joel Goulet-at bookseller site. 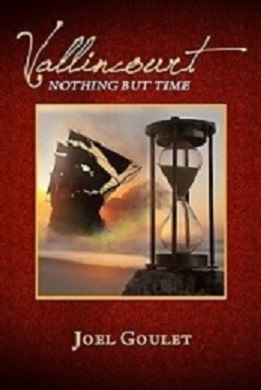 Car boot sale ad details Vallincourt: Nothing But Time is a fantasy / sci-fi novel. for sale in London. Vallincourt: Nothing But Time is a fantasy / sci-fi novel. available on car boot sale in London. More Fiction books for sale in London and more second hand sale ads for free on 2lazy2boot - London car boot fairs - 31613.